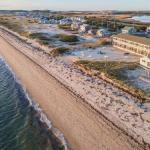 A waterfront Cape Cod lodging option with a private beach the non-smoking Sandbars Inn on Cape Cod Bay allows guests to take in ocean and bay views as well as to stay connected with free Wi-Fi. The two-story Sandbars Inn features exterior corridors and 16 rooms. All rooms come with free Wi-Fi fully equipped kitchens with blenders and toasters cable TV DVD players hairdryers and balconies or patios. All rooms are non-smoking. Guests need only take a few steps from their rooms to reach the private beach. Pets are welcome for an additional fee. Parking is available. Located near the northern tip of Cape Cod in North Truro Sandbars Inn is two miles from Provincetown and a 15-minute drive from Wellfleet. North Truro offers a host of recreational activities within minutes of the inn including whale watching hiking boating fishing and golfing. Cape Cod National Seashore is eight miles away. Logan International Airport is 114 miles away.